For a filmmaker who has attracted controversy throughout his career, the maverick behind Platoon, Wall Street, Born On The Fourth Of July, Natural Born Killers and Snowden, Oliver Stone is sounding remarkably reasonable. Asked for his view of the Trump administration, the director of three movies about American presidents – JFK, Nixon and George W. Bush –responds diplomatically. Stone’s towering, often bombastic career in American cinema includes 20 movies and a series of late career documentaries on political subjects. Along with success and failure on an operatic scale, he has won three Oscars with another eight nominations. But despite fielding arguably more flak than any leading director in Hollywood, the 70-year-old continues to tackle controversial subjects. While not officially announced, Stone confirms he is making a new film about Russian President Vladimir Putin that will be out soon. It will be a hot ticket given claims about Russian influence on the US presidential election and within the Trump administration. 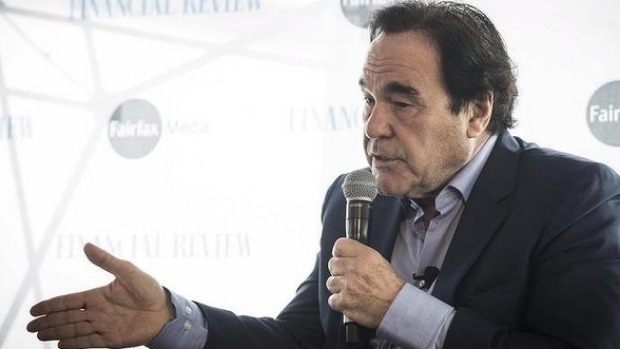 READ MORE: Does Oliver Stone think Pokemon Go will turn us into robots? The film will cover Putin’s view of events since he first became president in 2000. “It opens up a whole viewpoint that we as Americans haven’t heard,” Stone says. “We went to see him four different times over two years. How did he find the hardline Russian leader? While Stone grew up a Republican with a father who was a stockbroker, his view of the world – and his politics – changed while serving in combat during the Vietnam War, winning a Bronze Star and a Purple Heart. He reportedly voted for Barack Obama as president in 2008 and 2012, then Green Party candidate Jill Stein last year, but strongly refutes claims about Russian influence on the Trump presidency. “That’s a path that leads nowhere to my mind,” Stone says. “That’s an internal war of politics in the US in which the Democratic party has taken a suicide pact or something to blow him up; in other words, to completely de-legitimise him and in so doing blow up the US essentially. Despite making many passionate movies about livewire political subjects, Stone seems pessimistic about their impact. “I’ve done in my own work three Vietnam War films, three presidential type films, one film on Central America, one economics film on Wall Street and so forth,” he says. “And in the matter of war, they’ve had no influence. “Perhaps some people have recognised the humanity in them in their stance about war and what its meaningless is, especially when it came to Vietnam, but that has not been translated into an argument against Iraq or Libya or Syria or Afghanistan. It’s very frustrating to be a veteran of a war and have America not listening. After early success writing Midnight Express and Scarface, Stone has also directed Salvador, The Doors, Any Given Sunday, Alexander, World Trade Centre, the sequel Wall Street: Money Never Sleeps and Savages. He has made documentaries on Cuban leader Fidel Castro (the most recent being Castro in Winter), leftist governments in Latin America (South of the Border), Venezuelan president Hugo Chavez (Mi Amigo Hugo) and American political history (the series The Untold History of the United States). Amid escalating nuclear tensions with North Korea, Stone says he is disturbed by where recent US attacks on Syria and Afghanistan might lead. “I’m 70 years old,” he says. “I’ve been around for the Cuban missile crisis. I’ve seen our forces in action in Vietnam. “I was around for Mr Reagan’s – people found out later – near-nuclear confrontation in 1983 [when a Soviet early warning system wrongly reported the US had launched intercontinental ballistic missiles]. It came very close to war. “There have been near accidents all along the way. We felt with the agreements between Gorbachev and Reagan and after the Soviet Union disintegrated that this thing would be over for many of us – a peace dividend that the United States would get off its war footing – but nothing changed. Stone laments that his latest movie, Snowden, was poorly received in Australia last year. He considers it an important film for attempting to tell the truth about the US intelligence contractor who revealed the extent of covert government surveillance. And he believes the move towards all-seeing surveillance technology could be a huge mistake. “I think we’ve had a lot of false information – fake news as they say – used for political ideological purposes,” he says. “In other words, the US has been able, because of this technology, to say without any doubt Russia hacked the election. This is coming from who? From the intelligence agencies that are fighting against Russia with all their hearts and minds. As US federal prosecutors weigh up whether to bring charges against WikiLeaks founder Julian Assange, Stone remains a fervent supporter of a man he has visited in the Ecuadorian embassy in London. “For 10 years now he’s been a beacon of integrity and honesty,” he says. “He’s been very helpful to understand the world to those who pay attention. Assange has been in the embassy since 2012 in order to avoid going to Sweden to face sexual assault allegations. Stone does not believe claims that individuals one step removed from the Kremlin passed sensitive material to WikiLeaks as part of a Russian plot to influence the presidential election last year. Seven years ago, Stone declared he was not optimistic about the US, saying: “The Empire’s in its last days. Babylon will fall.” So how does he feel about the state of his troubled country now? “If you study my work, you’d understand that I’ve become increasingly alarmed,” Stone says. “As a young man, I was very conservative. “My father was very much a Republican and I grew up that way. But my life experience has taught me differently. I’ve made films that increasingly reflect that point of view and my fears.